Kestrel 0793 Tripod Clamp holds any model Kestrel, and attaches to any standard tripod. 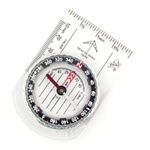 This compass has 2 degree graduation lines as well as large numerals at every 20 degree mark, and its clear base plate makes it easy to read a map and set bearings. To get a precise wind direction, simply point the large base plate arrow into the wind, turn the bezel to match the red North indicator to the red needle, and read the wind direction at the base plate arrow. This full-featured compass has a declination correction scale to allow you to make quick adjustments of map bearings to field headings, a sure-grip dial and ergonomically-contoured base plate, includes inch and millimeter rules for mapping and plotting. The Nitelze Belt Clip Case provides total protection for your Kestrel 4000, 4100, 4200, 4300 or 4500, as well as an easy way to clip it to to your belt or backpack. It's is designed to expose only the Kestrel's sensors - so it will continue to record accurate readings while protected. The Nitelze Carry Case is made of a sturdy triple laminate of polyurethane, vinyl and nylon, with neoprene rubber inside to hold the Kestrel 4000 series snugly. 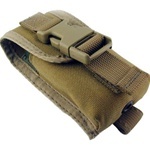 The rugged clip accomodates up to a 2 1/4" belt, and can also be attached to your waistband. There's also a strong hook and loop strap - for secure and easy mounting to a backpack or harness strap. Replacement impeller for all Kestrel Meters. User replaceable. 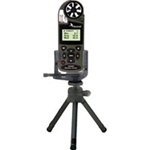 Kestrel 0807 Portable Tripod is compatible with any Kestrel wind meter. 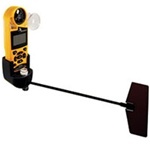 Clamp any Kestrel into this sturdy but lightweight tripod to take readings in the field. 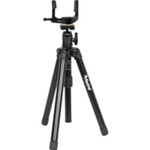 Kestrel 807’s tripod legs extend to permit a maximum height of 10 inches and a minimum of 6 inches. Ultra-compact and portable, it folds to just 7.5 inches and weighs 0.3 pounds. The top clamp also detaches and is compatible with any tripod with a standard tripod mount (1/4" 20 thread fitting). Padded carry pouch included. Kestrel 0806GRN Tactical MOLLE–Compatible Case – Green is a padded Cordura case that’s compatible with MOLLE attachment systems. A snap-down belt loop adapts to tactical vests and duty belts as well. The Tactical MOLLE-Compatible Case has been sized for the Kestrel 4000 line and will also hold a Kestrel 1000 to 3500 series in its carry case. This padded Cordura case is compatible with MOLLE attachment systems, and the snap down belt loop adapts tactical vests and duty belts as well. The front pouch is perfect for spare batteries or a compass. All the while the sensors are still exposed so your Kestrel 4000 will continue to log accurate readings. Available in Tactical Black or Brown. Kestrel 0806BLK Tactical MOLLE–Compatible Case – Black is a padded Cordura case that’s compatible with MOLLE attachment systems. A snap-down belt loop adapts to tactical vests and duty belts as well. 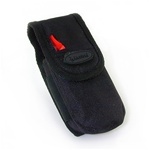 0806BLK has a front pouch which is perfect for spare batteries or a compass. The case keeps the sensors exposed so your Kestrel 4000 will continue to log accurate readings. The Tactical MOLLE-Compatible Case has been sized for the Kestrel 4000 line and will also hold a Kestrel 1000 to 3500 series in its carry case. The Kestrel Portable Vane Mount is an ingeniously simple accessory designed for extreme light weight and portability. The Vane Mount assembles in seconds and the precision pivot and lightweight vane extension allows the unit to spin freely in the slightest of breezes. The incorporated level ensures that the Vane Mount is installed correctly and that direction readings will be accurate. Paired with the Kestrel's 2000 data-point memory log, extensive data can be collected including wind speed and direction. Compatible with the Portable Vane Mount and any Kestrel Meter, the Kestrel Collapsible Tripod makes for easy, hands-free measuring out in the field. Extend the tripod to 51" and collapse it to 14". Easily carry the Collapsible Tripod thanks to its lightweight 1.7 lbs. Using the Collapsible Tripod, Vane Mount, and USB Interface together transforms your Kestrel Meter into a portable weather station. 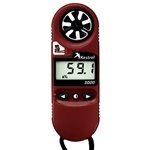 The Kestrel 1000 Wind Meter is the base model in our extensive assortment of Kestrel pocket weather meters. Simple and compact, the Kestrel 1000 fits right into the palm of your hand. It's also extremely durable and totally waterproof, allowing you to measure wind speeds in even the harshest weather conditions. It even floats. 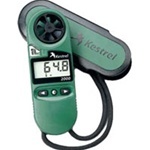 Convenient and reliable, the Kestrel 1000 is the perfect tool for those that rely on accurate wind speed information. Kestrel 0804SER Kestrel 4000 Series Interface – Serial Port for Kestrel 4000 Series Wind Meter or Weather Trackers is an ideal companion to any model in the Kestrel 4000 family. Whether you own a 4000, 4100, 4200 or 4500, with the optional computer interface, data can be uploaded for long-term storage, in-depth analysis and detailed charting. This new software is extremely easy-to-use and allows users to review, analyze and store their data easily and efficiently. Simply connect the interface cable to the appropriate port on your PC, rest the Kestrel on the cradle and the Kestrel Communicator automatically recognizes which model Kestrel Meter you are using and uploads the data appropriately. The Kestrel Interface is available with either a Serial Port connection or USB Port connection. Kestrel 0802 RH Calibration Kit The large container is used to create a stable environment. The small containers are used to hold the saturated salt solution. The saturated salt solutions generate well-defined humidities when they are confined to a contained environment. -Included carrying case to hold all of the above and maintain a stable environment while performing calibration Kestrel 0804USB Kestrel 4000 Series Interface,USB Port, for Kestrel 4000 Series Wind Meter is an ideal companion to any model in the Kestrel 4000 family. Whether you own a 4000, 4100, 4200 or 4500, with the optional computer interface, data can be uploaded for long-term storage, in-depth analysis and detailed charting. With Kestrel Interface and Communicator Software, data can be uploaded for long-term storage, in-depth analysis and detailed charting. This new software is extremely easy-to-use, and allows users to review, analyze and store their data easily and efficiently. Simply connect the interface cable to the appropriate port on your PC, rest the Kestrel on the cradle and the Kestrel Communicator automatically recognizes which model Kestrel Meter you are using and uploads the data appropriately. The Kestrel Interface is available with either a Serial Port connection or USB Port connection. 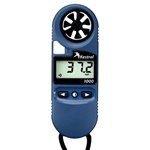 The Kestrel 2000 Pocket Weather Meter is the most elementary temperature and wind monitor in the Kestrel Meter collection. 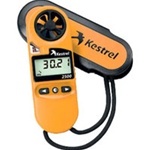 Capable of measuring both wind and temperature phenomena, the Kestrel 2000 Thermo Anemometer is a compact and durable weather meter that puts essential weather information in the palm of your hand. The Kestrel 2500 takes the great features of the Kestrel 2000 and adds in a pressure sensor. A three-hour pressure trend indicator helps you predict fish and wildlife activity and know when the weather's going to turn nasty. With its easy-to-use digital pressure altimeter, you have the perfect instrument for any outdoor activity. Because of its compact size and high durability, the Kestrel 3000 and Kestrel 3500 have become the pocket weather meters of choice for Wildland firefighters, concrete professionals, even professional coaches Kestrel 2500NV Pocket Wind Meter with Night Vision has a night-vision preserving backlight which helps users to sustain natural night vision. The NV's backlight incorporates an optical filter to reduce overall brightness and minimize blue and green spectrum light to preserve night vision. Additionally, NV backlights are also much dimmer than a standard backlight, making it more difficult to detect with the naked eye in night operations. This backlight appears soft grayish pink, not red, and is still in the visible spectrum, so is not compatible with night-vision equipment. The Kestrel 3500 measures temperature, wind speeds, barometric phenomena, pressure trends of up to 3 hours, and more. The Kestrel 3500 provides a complete range of weather measurements, but does not log accumulated data like the more high-tech weather meters of the Kestrel 4000 series. For those who need a full reading of only the latest weather information, the 3500 is the ideal Kestrel Meter. * Clock The Kestrel 3500 measures temperature, wind speeds, barometric phenomena, pressure trends of up to 3 hours, and more. The Kestrel 3500 provides a complete range of weather measurements, but does not log accumulated data like the more high-tech weather meters of the Kestrel 4000 series. For those who need a full reading of only the latest weather information, the 3500 is the ideal Kestrel Meter.